It is interesting HOW far I have come with truly understanding just how beautifully made we are. How GOD wove us in such a way that EVERYTHING within us IS TRULY CONNECTED!!!! How our past emotions can sit within us and create havoc: mentally, spiritually and PHYSICALLY!!! I truly believe GOD designed us in such a way that if we aren’t respecting our temple and dealing with all aspects (mind, body, soul) properly….our bodies will one way or another let us know ENOUGH! “Enough….you must deal with this (fill in the blank! )” I believe this is God’s way of helping us work things out here on earth so we can truly enjoy all HE has in store for us. I have a dear friend who introduced me to SPLANKNA more than a year ago. She shared with me a little bit about it. I bought the book and fell in love with it! But I still didn’t fully understand what it was all about. Then I did my first session and I was hooked! I recently did another session as a gift to myself. It was beyond amazing!!! Even if a person may think they have resolved past emotions, fears, hurts, etc…..the sub-conscience could still be holding onto some stuff that is effecting your body!!! We are amazingly complex and we must treat ourselves with great care because GOD loves us dearly and HE desires for us to take care of ourselves. 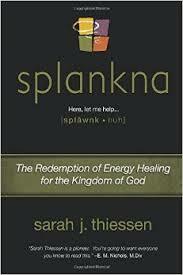 Today take a moment to learn a bit about SPLANKNA on Saturday….it might just surprise you! You might just find your ENERGY in a totally new way…GOD’S WAY! !